Tired of buying expensive vegan cheese? You can make your own for about $4 a pound, depending upon the price of raw cashews in your area. Want more fantastic dairy-free recipes? 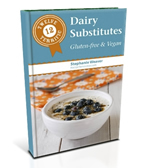 Check out my Twelve Terrific Dairy Substitutes, now on sale on Amazon. This cheese holds up to grating, melted well in a grilled cheese sandwich, and tasted good on a pizza. While it didn’t melt on the pizza, we liked the rich smoky flavor. You can substitute agar powder for the flakes. Use 2 teaspoons (5 g) of agar powder instead of the 2 Tablespoons of agar flakes. Reader tested and approved by Meaghan! If you can't find agar powder (also known as agar agar) in your local store, you can buy agar powder here. Do NOT try substituting gelatin for the agar. According to reader Amanda W., bad things happen. Try to find it online from a cooking supply store. There are lots of questions and ideas in the comments, so be sure to look there if you have questions. I had to close the comments because of spammers, but if you have a question that is not answered in the post or the comments, feel free to email me. I made this last night! Following the comments, I used 1/2 the lemon juice, except in other homemade cheeses I have preferred the taste of apple cider vinegar, so I used 2 tablespoons lemon juice and 2 tablespoons apple cider vinegar. It set up in the fridge right away! Once cooled, it did have a sort of gelatinous texture which I didn’t love, but after resting in the fridge overnight, it’s just a block of creamy moxarella, no gelatinous feel! I couldn’t wait for later so I had it on my breakfast. I still think that the raw texture is less than desirable, but when I bake or broil it, it gets this lovely brown crust that is really nice. Thanks for the recipe! I’m sure I’ll be making it again and playing around with different seasonings. It could be a bit tangier so I look forward to trying things like plant-based lactic acid powder, or lemon zest. I tried making this and whilst tasty, it didn’t set at all! Just stayed a thick liquid. I read comments before and so used less lemon juice and 2.5 tsp of agar agar powder but just got a lovely bowl of goo! Any suggestions as to what could be going wrong? Hello there! I have tried this recipe twice and it turned out mushy and not shreddable. Any suggestions on what i could be doing wrong? Thanks for writing. I would try soaking the cashews for just 4 hours and see if that makes a difference. The issue is the ratio of liquid to agar. Too much liquid for the setting agent = mushy. Alternately, you could try adding a little bit more agar… if using powder go up by 1/2 teaspoon. If using flakes go up by 1/2 tablespoon. Come back and let us know what worked for you. I’ve had a difficult time finding raw cashews in my area. How critical is it that my cashews be raw? Hi Konshu, I have not tried it with roasted cashews, so I can’t say for certain if it will yield the same results. Try it and let us know! Hello: I am thinking about using ground chia or flax seeds instead of the nutritional yeast. I cannot stand this stuff! Also, I like almonds better than cashews. How about using them is this recipe? Thanks. I know that nutritional yeast is not for everyone. I would simply omit it… if you add chia or flax seeds you are adding an additional binder which might affect how the cheese sets up. You can try, I just can’t promise you that it won’t affect the texture. You can use any type of nuts you like for the base. Let us know what you did and how it turned out! Can you please tell me how to convert this recipe in order to incorporate it into a raw food diet? Thank you. Autumn, I appreciate your question and know the value of a raw food diet. You might try experimenting with Irish moss as a thickening agent, which doesn’t need to be cooked. You have to cook agar in order for it to gel. Hope this helps! I cooked a chopped carrot in the water before I dissolved the agar in it (with the carrot still in the pot) and poured the whole lot into the blender. This gave the cheese a good colour. Looks good. However I used nutritional yeast like some time ago with some meals and stuff. Did not like the taste at all! Does not taste cheesey to me. If I make it I’ll using gram dhal instead and just drops of lemon(lemon overpowers food easily). Too bad my blender is weak. and I have no food processor. Hi Iylaleeya, I agree that nutritional yeast is an acquired taste. I have grown to love it. Let me know how your version comes out using the gram dal. If you soak everything well, you should have no problems making it with a weaker blender. Good luck and please report back. Thanks! This was so easy and very very good! I can’t get nutritional yeasy in Portugal. Can i use a substitute? Your recipe sounds wonderful. Have you tried adding pimientos? I make a no-cheese macaroni and cheese that has piminetos in it and so looks like cheddar. Not sure if the taste is any different with or without it. Love hearing all of the different ways people are tweaking this recipe and where they find agar. Never thought to check at an asian market for it. Bet it will be much cheaper at our local “super” asian market than at Whole Foods or Sprouts. I will have to try pimiento… do you use canned/jarred pimiento and is that the same thing as roasted red peppers I wonder? My only experience with pimientos is stuffed inside cocktail olives. Great idea! I ended up ordering a whole bunch of it from Surfa’s Culinary online after checking prices around the interweb. 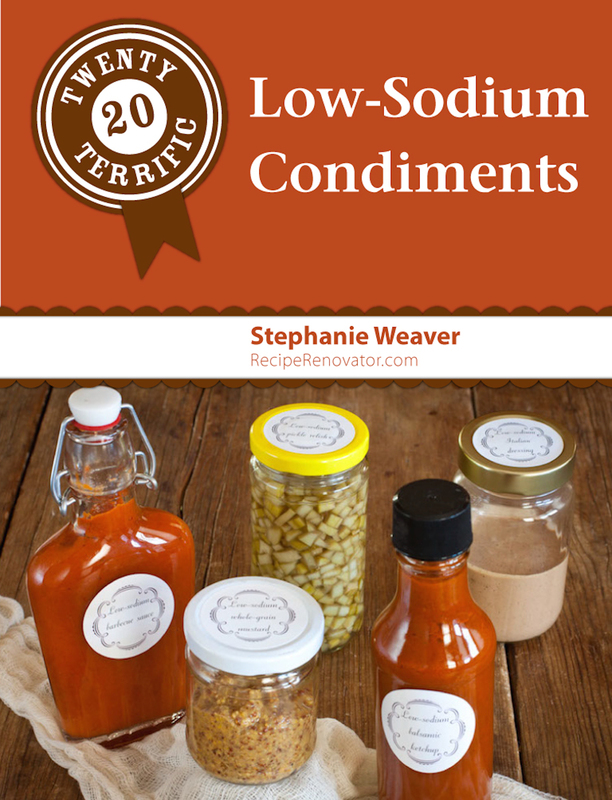 I used the jarred ones and have also wondered if the taste is the same with pimiento and roasted red peppers. Going to make your cheese tomorrow. Have you tried soaking the nuts? I have read that it helps them blend smoother but have never tried it myself. Sorry I see that you do soak. Will pay more attention to directions next time. Yes, sorry I didn’t catch your comment earlier. I always recommend soaking nuts and seeds, because it reduces the phytic acid in them, allowing them to be digested more easily. Thanks for sharing the link about the difference between pimientos and sweet bell peppers. I had no idea! But I definitely need to come up with a pimiento cheese recipe now! This looks incredible and just what I have been searching for! Will try it tomorrow definitely!!! Can you tell me if you know of a way to make a vegan/soya free cream that whipps??? sorry, I also forgot to ask- what is the English equivalent of nutritional yeast please??? As for a vegan whipped topping… I’ll add it to my list! Actually, you might want to try the frosting for my mint chocolate whoopie pies (without the mint) as a vanilla whipped topping. It’s pretty good. I’m soaking the cashews right now to make this tomorrow morning 🙂 couldn’t find smoked sea salt or smoked paprika, but I did find ‘liquid smoke’ and will be trying that as a substitute! This is my first time cooking with agar agar so wish me luck! Steph, I would use just a drop or two of the liquid smoke (about 1/8 teaspoon if you’re using Imperial measurements). It’s very strong, but super yummy. Good luck! Thank you for this recipe! This is the second time I have made it. The first time was good but I added too much garlic on accident and ended up using the bulk of it in a vegan lasagna which was phenomenal!! This time I used almond milk instead of water, eased up a little on the lemon and garlic AND it came out delicious! Thank you sooooo much! I cannot wait to make some nachos with it next time. This is perfect for my vegan, gluten free life!! This is a great recipe, I love how it firms up. I want to try it with lots of different flavour combinations 🙂 I posted my attempt on my blog today. wow loks yummy. i have tried doing this but the flavor was yukky. i did it with amonds and nah did like it. does it have a very cheesy flavor or not? thanks for sharing. I’d love to know why my “cheese” doesn’t come out solid enough to grate. It gets solid enough to slice, though it’s still reasonably soft and no way will that grate. It’s delicious. But not grate-able. Any suggestions? I’ve tried using slightly less water, using less lemon juice, adding chickpea flour as a thickener, cooking the agar for longer. Nothing seems to help. So sorry you’re having trouble. It sounds like you have done a ton of trouble shooting as well. My cheese turns out fairly soft… I can definitely grate it, but have to gently use the box grater to do so. I’m not sure what else to tell you to try. If I think of anything I’ll let you know. Glad you all like it so much! I usually make a double quantity. Maybe your grater is old and dull? Dull graters force you to push harder, making the cheese fall apart.. I just made a new batch using agar powder that was brought for me from the USA. This time the cheese is much firmer, and will most definitely grate, as well as slice. I had been making only creamy cashew cheese for the last 2-3 weeks, since my packet of agar flakes had run out and I knew my agar powder would be arriving soon. We enjoy cashew cheese spread, but my kids were delighted today to be able to cut a *piece* of cashew cheese and put it on a cracker. We’re looking forward to making pizza with this cheese later in the week. Thanks again so much for this recipe. I have also shared it with several vegan friends. The sauce is amazing. I wanted to lick the blender clean. How long does it need o be I. The fridge to harden? Thank you for bringing back delicious cheese into my life. Amazing!!! Lisa, it should firm up in about 30 minutes or so. The nice thing about those cashew-based recipes is that even if they don’t firm up, you still have a delicious sauce or spreadable cheese. Let me know your results. try this recipe this morning, and definetely the lemon juice is WAY too strong. did a second batch (with no lemon juice) to mix with the overpowering lemon one. the mixture still had too much lemon taste and to counterbalance, i add agave nectar. huge tip: use only drops of lemon!!! Hi Erika, thanks so much for writing in! Everyone’s taste is different, and lemons can also vary greatly in strength. Great tip to add the juice a little at a time. Thanks for reading and letting me know. I made this cheese yesterday and had some this morning. It came out perfect. I’ve tried a few other cheddar recipes but was not happy with them. This one seems to have nailed it. I didn’t have any smoked sea salt so I used a little smoked paprika. I’m very happy. Yay! I love getting comments like this Lesley! Thanks for letting me know. I’ve tried this recipe three times and it always comes out as a spread rather then a block of cheese. I’ve tried reducing the water ratio significantly and no luck.. Anyone have any tips that might help? Marie, I’m so sorry you’re having trouble with the cheese recipe! It sounds like you’re not getting the correct firming action, which means that some aspect of the agar agar isn’t working. I would try a different brand, add a little more, etc. If you are using flakes, trying adding another tablespoon. If you’re using powder, try adding another teaspoon. It should visibly swell and get gel-like when you cook it, before adding it to the cashew mixture. The consistency of this cheese was impressive. The overall flavor I had to tweak because the lemon flavor was way too strong. I used bottled lemon juice instead of fresh, could that be why? Dunno. I added some black pepper and some more salt. Once I combined the cheese with pizza sauce, the strong lemon flavor was undetectable. Thanks for the recipe! I will have to keep messing with it to get it right. Bethany, sounds like you’re renovating the recipe to suit your taste, something I heartily support. Yes, if you use bottled lemon juice the taste will be really strong. Glad you liked it enough to keep making it! Thanks for reading and reporting back. I made the cheese tonight, put it in the dish to refrigerate, but tasted some off of my scraper from emptying my vitamix. Soo good. I got out a bag of chips and had nachos with cheese sauce. The cheese block tomorrow will be significantly smaller than it started out! Thanks for the great recipe, it was very easy to make. Hi Boop, SO happy to hear you had a good experience with the cheese. I need to make it myself! I am confused on your abbreviations of “T” and “t”. Is “T” tablespoon or teaspoon? Sorry for any confusion. Capital T. is the standard abbreviation for Tablespoon, while the small t. is the standard abbreviation for teaspoon. how will this hold up for baked macaroni? will it melt well? This is yummy, thanks for posting the recipe. I left out the nutritional yeast as I am intolerant to it. I only had limes on hand so I used that instead of lemon, plus I added some dill. It tastes really cheesy and is quite moreish! Glad to hear you could renovate it to suit you and that you liked it! 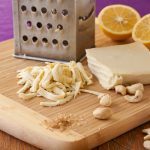 This is the best vegan cheese recipe I’ve tried- I want to try tweaking it a bit though to fit my tastes more, so I have a couple questions- is the lemon there for flavor or is it necessary for another reason? I’d like to leave a lot of the lemon juice out. Also, I’ve seen some vegan cheese recipes that leave the cheese out for a day to “culture” it- probably giving it a more cheesy flavor. Would that be possible with this recipe? Hi Ange, thanks for the nice compliment! The lemon is mainly flavoring so feel free to experiment. I haven’t tried leaving it out for a day or two to culture it but don’t see any reason why you should try this. As with all culturing, fuzzy mold is okay (just scrape it off) but brightly colored molds are dangerous. If that should occur, throw the whole thing out and start over. Happy cheese-making! Do you think guar gum would work instead of the agar? I would NOT recommend using guar gum in this recipe. Sorry! This sounds like it could be very good, thanks! 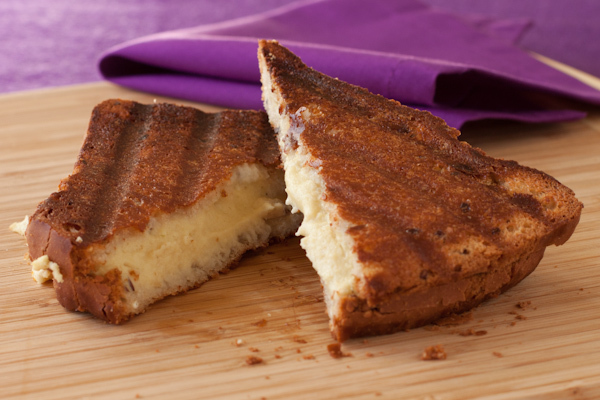 Looks like it came out wonderful on the grilled cheese, so if it melts gooey like that on there then it should work in a lot of recipes. I used one pic from here and linked to your post in a post with several resources for making your own vegan cheese. If that’s not ok please let me know! Thanks Col! Yes, I was surprised they were having trouble finding it. Thanks for the tips! I am pretty sure I buy the same brand, the white packet with the red and blue writing on it. What could make a subtitution for the yeast other than legumes , what does the yeast do excatly so I know what I could better replace it with 🙂 we do not eat yeast at all . Miranda, you can skip the yeast. 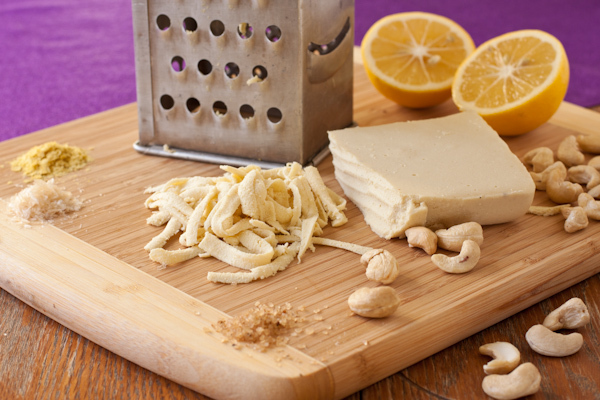 It adds a pleasantly cheesy taste and is used in most vegan cheese substitutes. You could add additional spices or a toasted flour in the same amount in the recipe. Let me know what you try here in the comments. Thanks for writing! Do you think I could use regular sea salt instead of smoked sea salt? Whitney, absolutely! The smoked sea salt does add some more smoky flavor but it’s not essential. Thanks for writing! Do you think if i substituted equal amounts of gelatine powder for the agar powder, it would still work? Someone else from Australia said she either couldn’t find it and/or it was insanely expensive. You can try searching online. I do think gelatine would work, I just haven’t tried it to know how much you’d need. I would suggest substituting the same amount of gelatine and making a half-batch as a start. That way if I doesn’t work, you haven’t wasted much cashews. Please let me know what you discover and I’ll amend the recipe. I wonder if pectin would work if you’re looking for something vegan? It’s typically used to make jams gel; it might not come out as thick, but it’s worth a try if agar’s not available. I bought the ingredients to make this today, however I’m going to have to use Gelatine 🙁 Turns out here in Australia Agar Agar is really really expensive (nearly $30 a packet). Hopefully it still turns out. Ben, I used fresh lemon juice with no problems. I guess ignorance was bliss in this case. Squeeze away! I am excited to try out this recipe. I just have a question. Can I use other nuts instead of cashews? like almonds? Thanks so much for the question. I would think that this would work with just about any kind of nut. Give it a try and let me know! I always love it for people to send me pix so I can post them on Facebook too. To get the nicest texture, I would soak the almonds and rub off the skins before using, although it would work fine with them whole. Hope this helps. I tried this recipe using cashews (will use almonds next). I made it twice. The first batch was watery, and that’s because I added too much water to the agar powder. But it was a great spread for crackers. The second batch turned out better than the first. It was more firmer, but not firm enough to grate. (It was still very delicious! and would make it again). I wonder if I am adding too much water still. I added about 1 1/2C of water to the agar powder (last time I added nearly a tall glass of water). It had more of a cheesecake texture. Any suggestions? Hi Susana, I would try it with one cup of water and see what texture you get. Perhaps you aren’t completely draining the cashews after soaking, and it’s throwing the texture off. It should be a firm block, promise! Any advice if i want to substitute the agar powder with organic corn starch? Thanks so much for the question. I really would NOT recommend trying this with corn starch. Agar is what causes the cheese to bind together in a block. You could try gelatin if you’re not vegan. Corn starch would thicken it but not create a block. Agar is very inexpensive and is pretty readily available. Hope this helps. hi, can i make it with the onion and garlic powder removed? I am forbidden to eat the garlic-onion plant family. What can i used as a subtitute? And just a info, if you wants to search agar agar, try to search in asia store, or pecinan, because in my country(i am from indonesia) agar agar is really cheap and can be found even in local small store. it cost even less than a half dollar. It sold in medium sachet. Hi Zhang, thank you for your question. Where in Indonesia do you live? I have been to Java and Bali and loved them both. Yes, you can make this without those powders. You could use any kind of spice you want to try: hot dried pepper, curry, or seeds like caraway would all be very good. Yes, agar agar is sold here in Asian stores. Can this be water bath or pressure canned for storage? Hi Rhonda, I am sorry that I don’t know the answer to this. Maybe another reader might be able to comment on it… you could ask the question on my Facebook page. The recipe is so quick and easy that I don’t actually see the benefit to preserving it through canning. I also don’t know enough about canning safety to feel comfortable answering the question. Thanks for reading! I make this cheese with oats instead of agar. When you made the oat cheese, did it shred and melt? can this be frozen & used later so i don’t have to make a REALLY small batch? Hi Sheri, I haven’t tried freezing it… give it a try and let us know and I’ll add that note to the recipe. Thanks for reading and commenting! So glad we chatted about this! Can’t wait to try it. 🙂 Hope you’re having fun at camp! Yes please let us know. I know one reader made it with her niece and nephew and they had fun making it, too. Another recipe I’m excited to try – once I find the agar. I’m sure with a little hunting I can find it. Love how unprocessed this vegan cheese is! You might want to follow October Unprocessed over at Eating Rules. It’s a great challenge and I always blog about it too! I made this and it was a great addition to my beans and rice this morning! It was so easy to make–I will definitely be making again–and adding in other flavors like peppers or dill, etc. Hooray! Noelle, NOTHING makes me happier than getting comments like this. Yay! Hi, can you please tell me what, if anything, can be used to replace the agar flakes? I can’t find it in my local supermarkets. Is that what contributes to the cheese melting in the grilled cheese sandwich? Hi Simone, sorry you have not been able to find the agar flakes or powder where you live. I added a link to the post so you can buy them online. While I’m not a chemist by any means, I do suspect they are key to creating a product that does then melt in a grilled cheese sandwich. Thanks for your question and let me know if you try the cheese! Agar is more of a gelatin replacement – it holds the ‘cheese’ together and makes it grate-able. The melting part is just from heating it in the sandwich. This looks great! Do you have any recommendations for yeast substitutes? I’ve heard cayenne might add the same flavor. I am on a yeast and sugar free diet and am gluten, dairy, and soy free. Nellie, I would try, but am not sure how it will work, 1 T. of smoked paprika plus 3 T. of garbanzo bean flour instead of the nutritional yeast. This is a really inventive use of two things I use regularly: soaked cashews and agar agar. I’m so glad to have found your recipe! I just made this and it is setting up in the fridge right now. I took out 1/4 cup of water and replaced it with some tahini, ume plum vinegar, and teaspoon of white miso (for extra tangy cheesiness). I’ll let you know how it turned out! Joy, Thanks so much for taking the time to comment. I am so excited to know you are making the cheese right now. Those renovations sound amazing. Please let me know how it turns out! Yum! Yay! 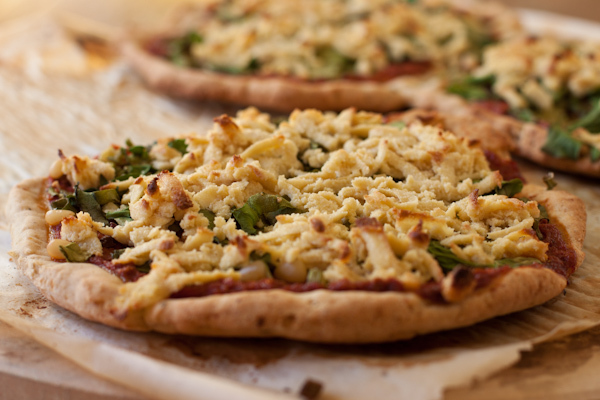 A vegan cheese recipe that does not require a cheese cloth. So excited to try this. What is the best way to store it after making it and how long does it stay fresh for? Hi Melissa, I store the cheese in an airtight glass or plastic container in the fridge and eat it within 5 days, like any fresh food. Thanks Jeffie. Let me know if you try it. I tried the daiya “cheese” and do not find it palatable at all! I am glad I found this as well! Shannon, I do like the Daiya cheese but it has a very specific flavor that I could see not being to everyone’s taste. It’s much more melty than this cheese, but this one is far less processed. Let me know if you try it, what you think. I have agar powder. Is it a straight substitution or do I use less? Hi Michaela, it looks like you can substitute 2 teaspoons of agar powder for the flakes, which is 5 g. Let me know if it works! I updated the recipe notes. Glad you liked it and fun that you tried the recipe I made a couple of weeks ago. Oh, wow. This looks amazing! Do you think I could sub some Irish Moss paste for the agar agar? You could try that… it might not firm up as much but would be an interesting experiment. You might need to press it with cheesecloth to get more moisture out of it. Let me know! Agar seems like a slightly more common and less intimidating ingredient for people than Irish moss, and really does a great job of firming things up. Hi! I was wondering how much irish moss did you used and how did the cheese turned out? Is there a replacement for the agar flakes? Hi Terya, the agar is essential to get it to firm up like cheese. It’s inexpensive and you can find it at natural food stores and Asian markets. Thanks for reading! Wow- impressive! Wish you could be my personal chef as I am not as motivated as you seem. I still have not yet created something as amazing as Daiya cheese but this was pretty good. I hope you can come to one of my cooking classes some time. Let me know how it goes. I hope you like it. I find it’s pretty tasty.